Remember the haunted house in grade school where your hand was guided into a bowlful of "brains"? Those skinned grapes have nothing on what happened to Rachel Cubitt of the York Archaeological Trust in England. 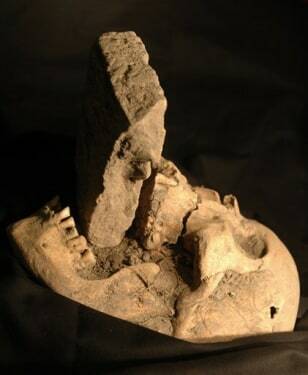 As she was cleaning a 2,000-year-old skull unearthed during a campus expansion project into a prehistoric farm, she "felt something move inside the cranium. Peering through the base of the skull, she spotted an unusual yellow substance," read a press release announcing the discovery of the oldest surviving human brain in Britain. The skull was found alone in a muddy pit. Researchers believe it may have been a ritual offering. 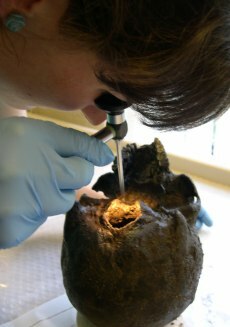 In this image, Cubitt is using an endoscope to examine the remains. Click the "Next" arrow above to learn about six more ghoulish archaeological discoveries. A wooden stake in the heart is one well-known way to thwart a vampire, but the method was insufficient in the 16th century. Back then, a sure-fire vampire slaying entailed putting a stone or brick in the suspected vampire's mouth so that it would starve to death. The remains of the 60-year-old woman found in a mass grave near Venice, shown here, was one of those purported vampires, according to Matteo Borrini, a forensic archaeologist and anthropologist at Florence University. At the time, plague ravaged the region. People were buried in mass graves that were often reopened to add new bodies. When they did, bloated bodies with blood spilling from their mouths and holes in their head shrouds were often revealed. These corpses were thought to be vampires. 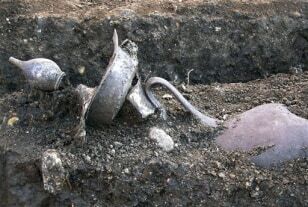 A 17th century iron ball and chain pulled from thick, black mud on the banks of the River Thames in London may have a gruesome tale to tell, according to scientists. The 18-pound shackles were found with the lock fastened and no key, suggesting the prisoner either slipped out of custody or drowned while attempting to escape. 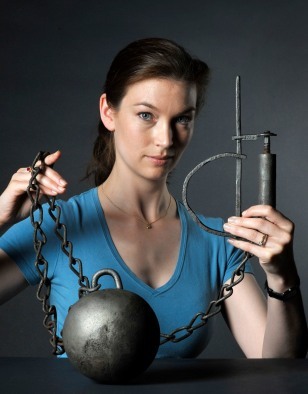 Kate Sumnall, an archaeologist with the Museum of London, shown here, told reporters the iron is of high quality and was unlikely discarded on purpose. Human remains found in one of two large, silver vessels in the heart of Aigai, the ancient capital of Macedonia, have thickened a murder-mystery plot. The unidentified remains, thought to date to the end of the 4th century B.C., were unearthed a few steps away from what some archaeologists speculate are the bones of Alexander the Great's murdered teenage son. What's odd is both burials are outside nearby cemeteries, suggesting either a form of punishment or an illegal act, archaeologists told the Associated Press. "Either way, it was an exceptional event," archaeologist Stella Drougou of Aristotle University, told the news service. "And we know the history of the Macedonian kings is full of acts of revenge and violent succession." For those afraid a witch may have cast a spell upon them, follow this recipe: pee in a bottle, toss in some fingernail clippings, strands of hair, iron nails, brass pins and a heart-shaped piece of leather pierced with a bent nail and then bury it upside down. If all goes well, the trick will cast the spell back on the witch, perhaps killing her — or so goes a 17th century witchcraft belief. Such a bottle was discovered in Greenwich, England, and dates to a time when witchcraft beliefs were more common, according to British Archaeology magazine. 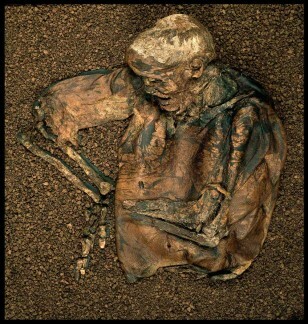 Someone in the first century had it out for Lindow Man, a 25-year-old found face down in a northwest England moss bog. Examination of the well-preserved body shows that the otherwise healthy gentleman suffered two blows to the head and a swift knee to the back. A cord tied around his neck was likely used to strangle him and break his neck. Then, just to make sure he was dead, his throat was slit. The sequence of events, some scientists suggest, is consistent with a ritualistic killing, perhaps a human sacrifice carried out by Druids. In 2004, a grisly scene was unearthed outside of modern-day Mexico City. Decapitated bodies were found tossed to the side of a burial tomb, their hands tied behind their backs. 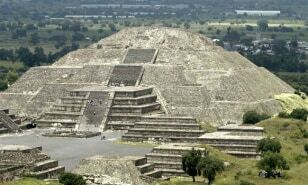 The discovery suggests the little-known culture that built the giant Pyramid of the Moon at Teotihuacan held bloody, sacrificial rituals. Two other bodies decorated with beads and greenstones, as well as animals and other offerings, were also found in the tomb. "Whether the victims and animals were killed at the site or a nearby place, the foundation ritual must have been one of the most terrifying acts recorded archaeologically in Mesoamerica," archaeologist Saburo Sugiyama of Aichi Prefectural University in Japan said in a statement announcing the discovery.